JASNA membership is open to everyone interested in the life and works of Jane Austen. We are excited that you are inquiring as to how to join JASNA – St. Louis. Whether we are meeting for a lecture, having tea, discussing characters, or realizing that Jane Austen’s works are still very much relevant today, we love to hear how new members see and experience Jane Austen. 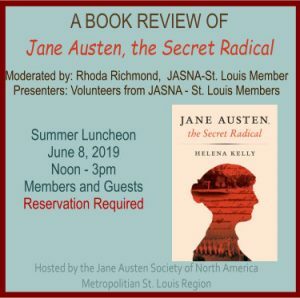 There are many benefits to joining JASNA and the Metropolitan St. Louis Region. JASNA-St. Louis is a regional group under the national JASNA society. To be a member of our group one simply joins the JASNA National Organization. When you join, please make sure to choose the “Missouri, Metropolitan St. Louis” as your primary affiliation. Many of our members live in the metro St. Louis area but some hale from central & southern Illinois as well as northeast and southeast Missouri. To join online you are required to join through the Jane Austen Society of North America (JASNA) website by filling out their online New Member Form. Doing so will create a new online member account with national JASNA. PLEASE MAKE SURE that under the menu option, “View/Update My Profile” you have chosen “Missouri, Metropolitan St. Louis“ as your primary region affiliate in order to join our us. Thereafter, you can access your JASNA account through the JASNA Member Portal. Prefer to pay by check? Print out the membership form below and mail along with your check. A Welcome Packet will be mailed to new members four to six weeks after receipt of the membership form and dues. We look forward to welcoming you as a fellow Janeite!